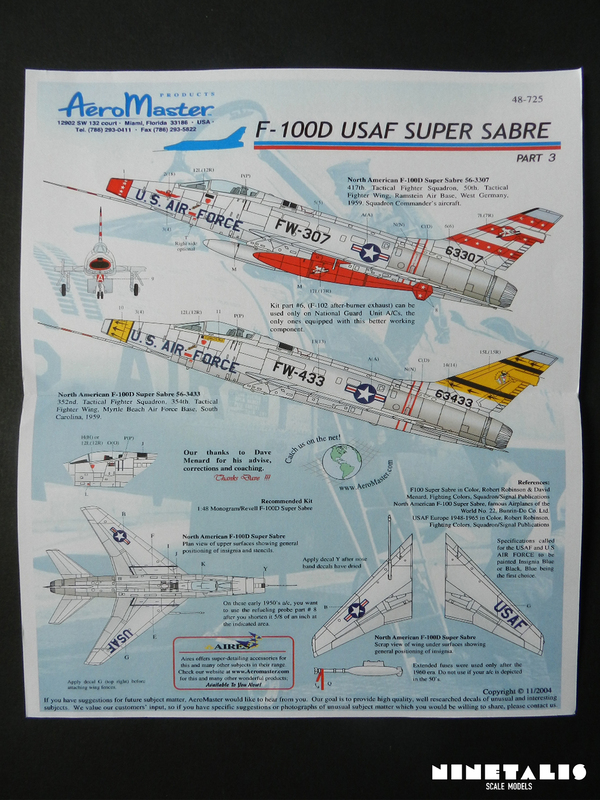 The F-100 was the first United States fighter aircraft that was capable of supersonic speed in level flight. It served with the United States Air Force from the fifties till the start of the seventies and with the Air National Guard (ANG) until the end of the seventies. 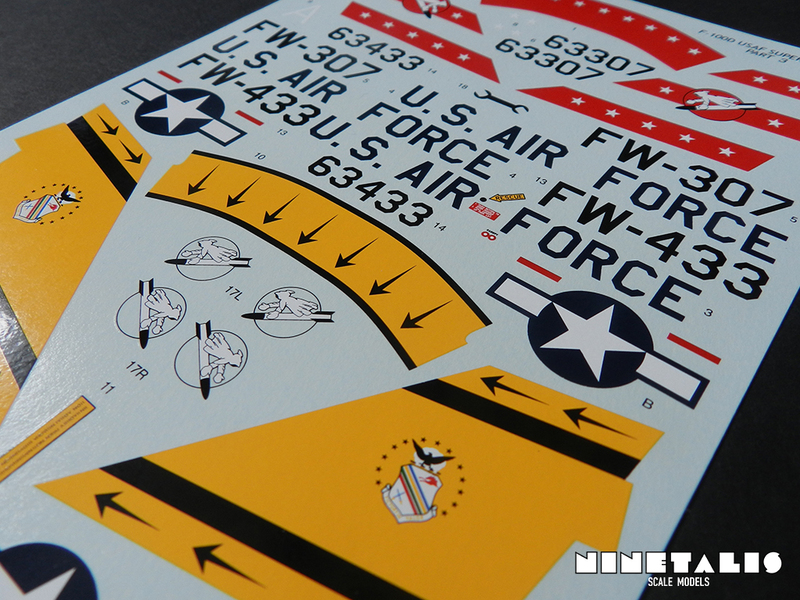 Its name is derived from the F-86 Sabre, as it was designed as a follow-on of that aircraft. The Super Sabres also saw military services in the Taiwanese, Danish, French and Turkish air forces. The D version of the F-100 was a Single-seat fighter-bomber with a larger wing and tail fin, landing flaps and advanced avionics. The goal was to address the offensive shortcomings of the F-100C, focussing to produce mainly a ground attack aircraft with secondary fighter capabilities. Its first flight was in January 1956 and in the end, 1,274 were produced. The D-versions that served with the Air National Guard (ANG) were also called upon during the Vietnam conflict. George S. Brown, the USAF General who commanded the 7th Air Force during the war, stated that the five best Super Sabre squadrons in Vietnam were from the ANG. All Super Sabres flew a combined 24 missions a day, delivering ordnance and munitions at a high reliability rate. In less than a single year, they flew more than 38,000 combat hours and more than 24,000 sorties. 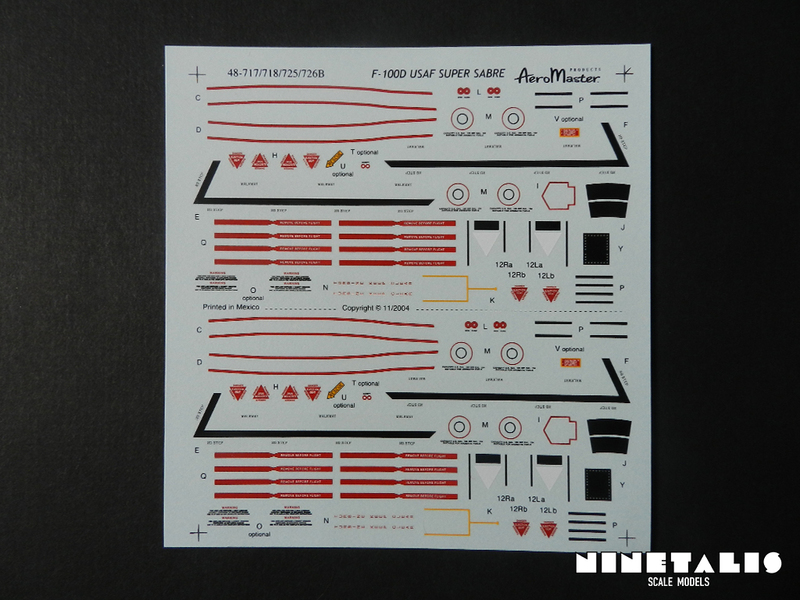 No worries though, if you want to build the both of them, the sheets provide with you all the decals that are needed to build both the aircraft. As said before, the user has choice between two aircraft. The first is serial number 56-6307 of the 417th tactical fighter squadron. There is photographic evidence showing this aircraft in a Vietnam war-time paint scheme, so it safe to assume that this particular aircraft also saw service in Vietnam. 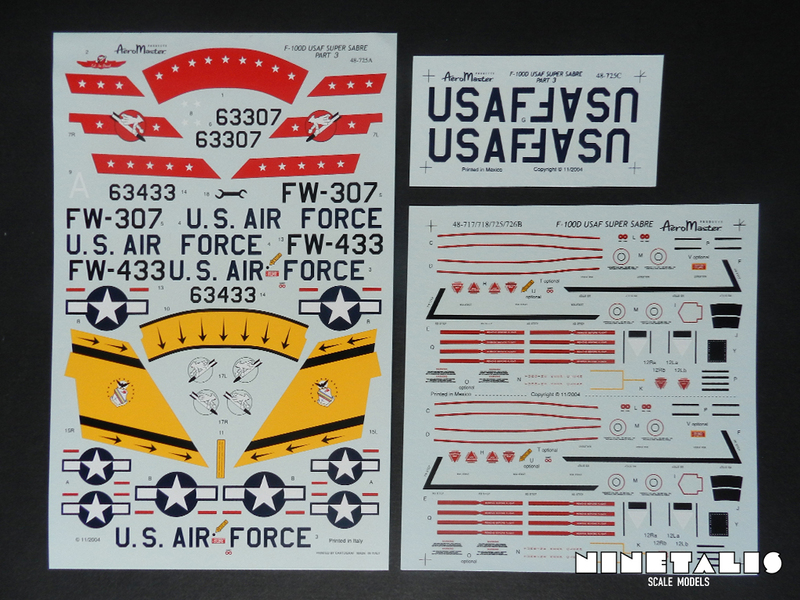 However, the decal sheet provides the aircraft in its more interesting ANG paint scheme before the war, which was based at the Rammstein Air base in West Germany during 1959. it was painted with orange accents on the nose and tail with white stars in them. This was painted over the usual ANG all silver paint job, which made the ANG F-100’s affectionally named ‘silver bullets’ by pilots and ground crew. A interesting detail is that the drop tanks and their hard point are painted completely in the same orange color. 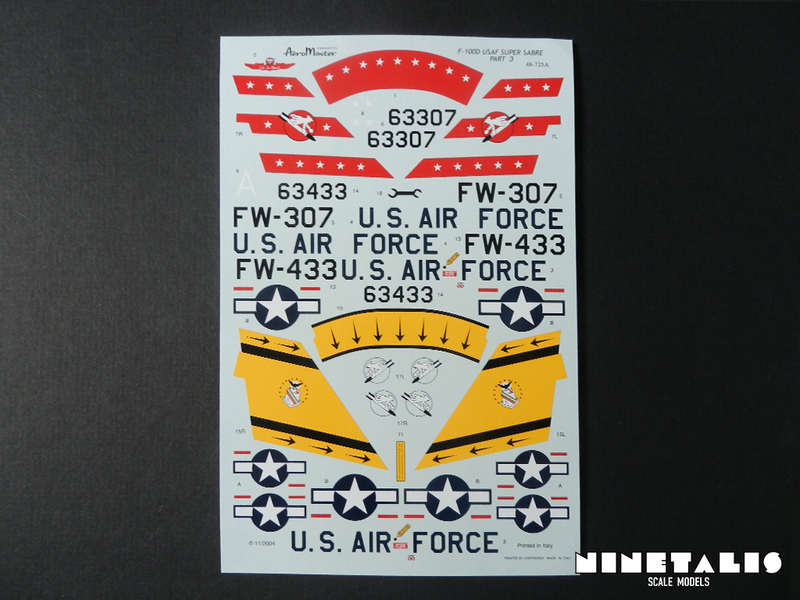 The second aircraft is serial number 56-3433 of the 352th tactical fighter squadron. It was based at Myrtle Beach Air Force Base, South Carolina. This aircraft was also painted in an all silver paint job, but instead wears yellow accents over the nose and tail. Sources state this aircraft was later sold on to the Danish Air Force, and even later arriving in the Turkish Air Force in 1969. It finally met its fate in a crash. As you might have noticed, this story does conflict with the information provided with the product, and I’m not really able to tell which one is right or not. Maybe somebody with better sources than me can shed some light on this. 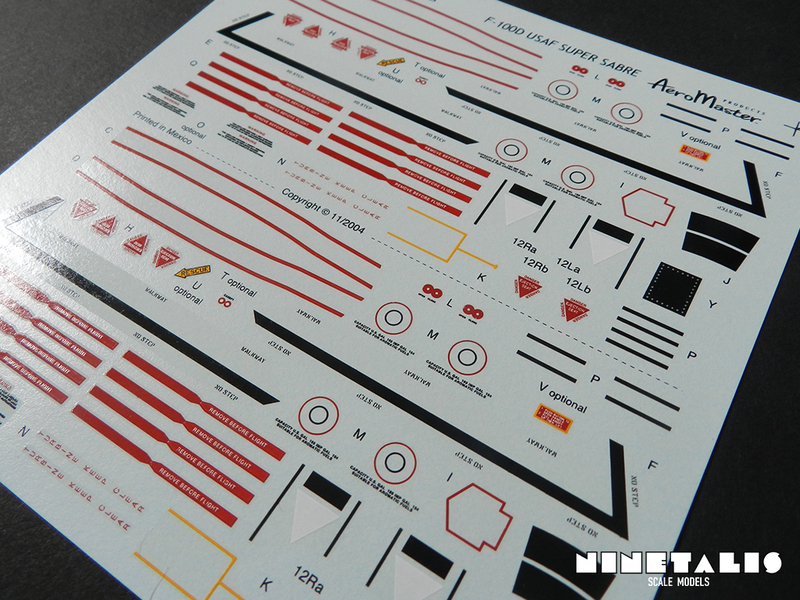 Also included is a small sheet of paper with corrections you can apply to the Revell/Monogram kit. It explains that the drop tanks are a bit too short and to pay attention to the refueling probes, as some details differ on each aircraft. Also the after-burner exhaust can only be used on ANG aircraft, as other units didn’t have this component. The decals are split up over 3 different sheets. 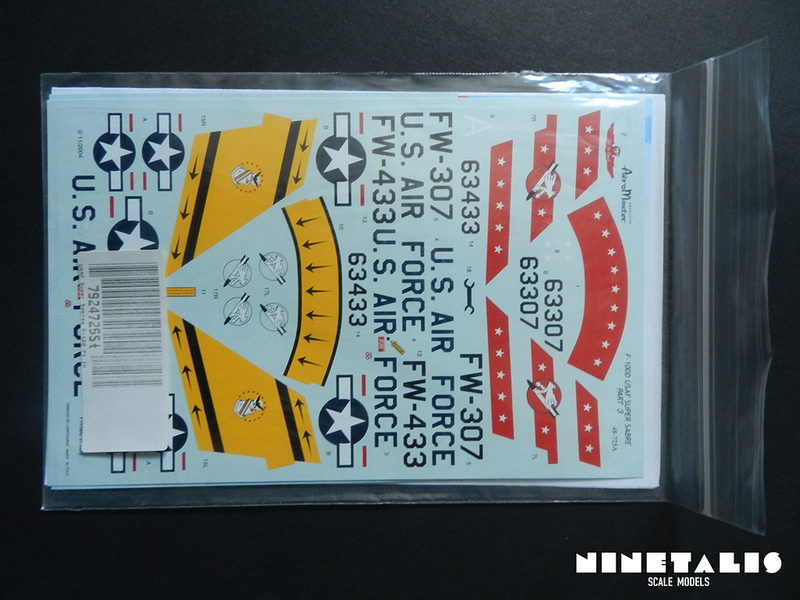 The first and largest sheet holds the Serial numbers, insignia’s, squadron patches and squadron colors. On the bottom it says that it was printed by Cartograf in Italy. The second one is slightly smaller, with the stencils, walkway lines, warning sign and remove before flight tags. 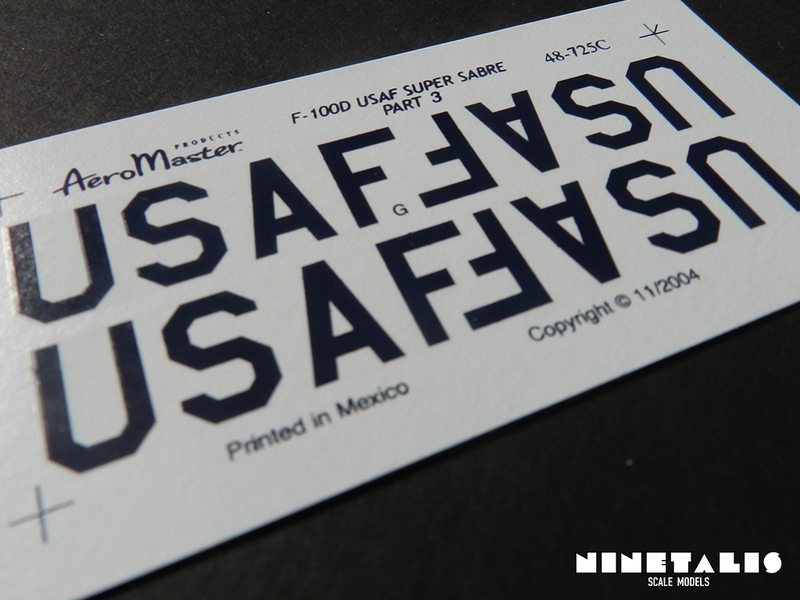 Oddly enough, this one is not printed by the Cartograf company in Italy, but printed in Mexico. The quality however seems to be alike, although I can’t be sure unless I would test it. The third sheet is really small compared to the others. This one holds the ‘USAF’ codes for the wings in insignia blue. 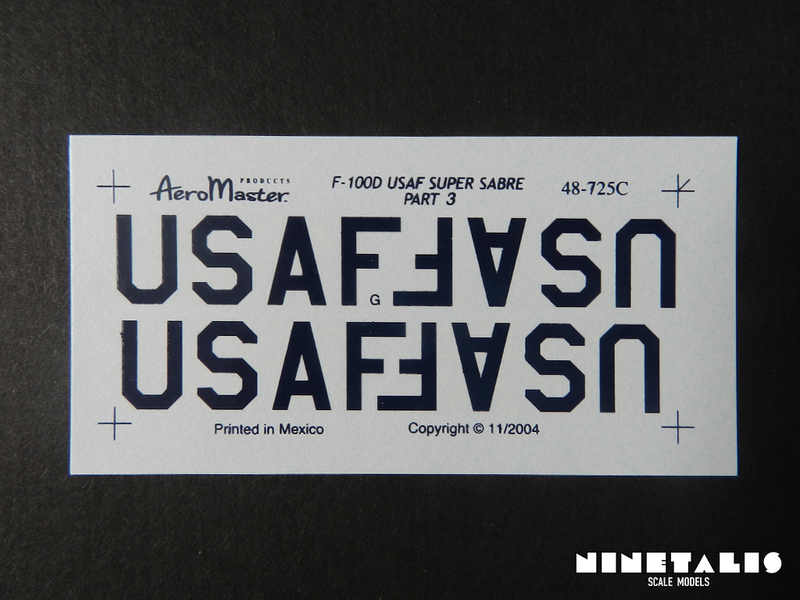 For those who wonder, each four USAF letters are combined into one large decal. Like the last sheet, this one is also printed in Mexico and also seems to be from great quality like the others. I’m very happy with these decals. 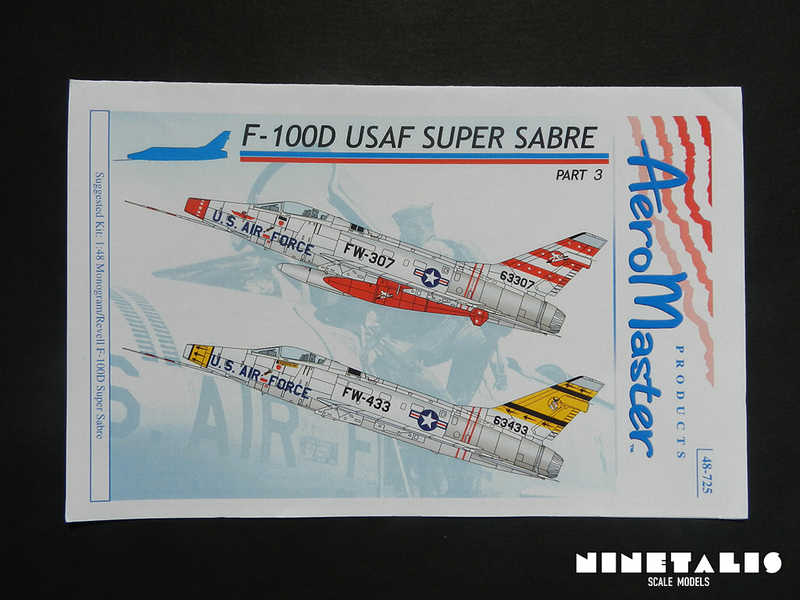 I think they will go fine with my Trumpeter kit, even if these are really designed to be used with the Revell/Monogram Super Sabre. AeroMaster has provided two quite interesting markings with a good amount of history, although much of it isn’t added with the information sheet. But Judging from photographic material that I could find, it seems that they actually did a good job on getting the paint schemes right, which is of course the most important part aside from usage capability. 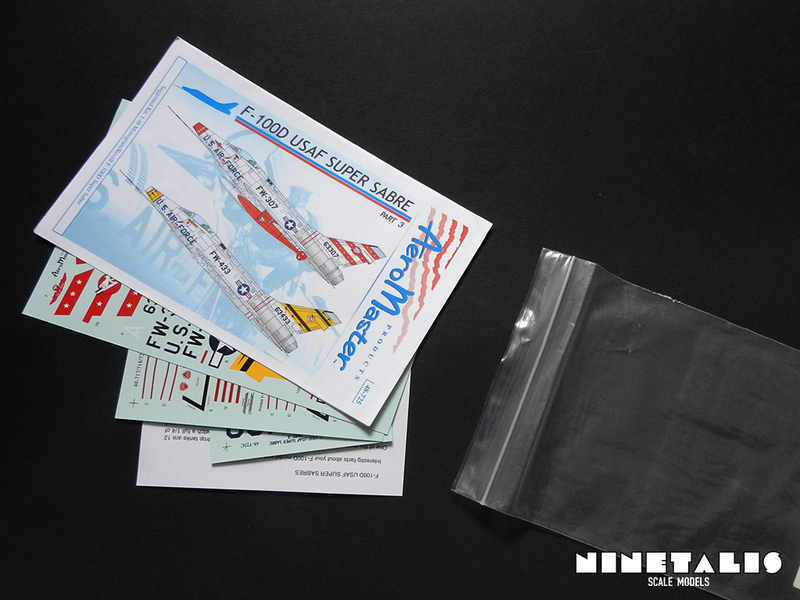 Since I haven’t used any of these so far, I can’t really say how well they will go onto the model or if they will crumble upon use, but since the most important sheet (containing the markings of the squadron) is printed by Cartograf, I can’t really imagine this happening. 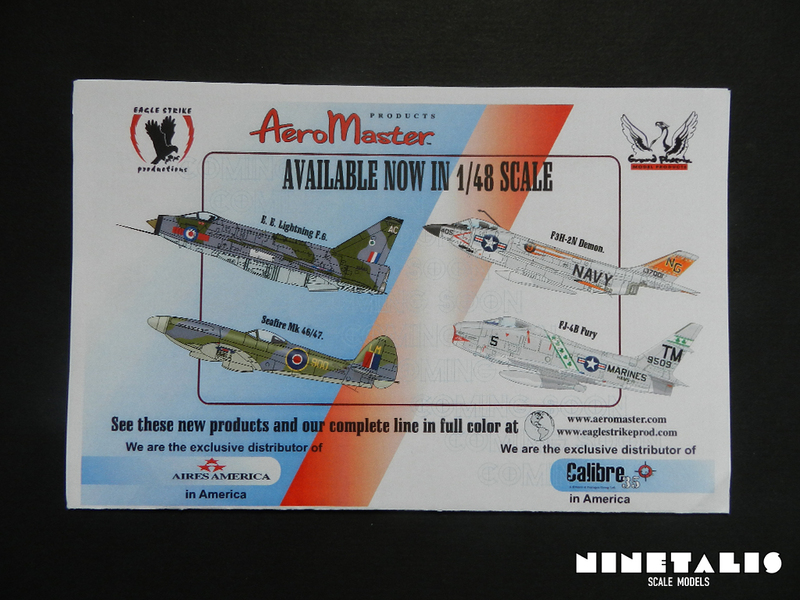 Definitely recommended to all builders with any level of experience or someone who wants to build a Air National Guard F-100D.